In this very special, No Air Conditioning in the Office Edition of Waiting for Wednesday, Alex sweats angrily and, depending on his mood as the morning progresses, may or may not talk about new comics. Mostly because it's hot and I'm tired and there's a lot of work to do. Did I mention that it's hot in the office today? It's okay, though, because the wall air conditioner units are blowing hot air. Yep. So that helps with the alleviation of the hotness. On top of that, I have a stack of too-hot-to-read-pages for three separate books that need my editing wizardry done by sometime this week. Possibly tomorrow. Or Friday. Maybe this afternoon. I forget. Anyway, looking through the list of new comics out this week, I've come to the conclusion that IT'S HOT IN HERE. And, because of that, I will make this short and sweet and to the point. Two books on the WfW watch this week (alliteration! ), and they're both from DC. Well, one's technically from DC/Vertigo, but who's keeping score, right? First up, we have the big, honkin' mainstream title of the week, Action Comics, issue 900. As they do with most anniversary issues in comics, Action 900 will feature a slew of top-name creators including Paul Cornell (current writer of Action Comics, MI: 13), Richard Donner (little film called Superman), David Goyer (little film called Batman Begins), and Damon Lindelof (little show called Lost). And it features a number of covers, including that beautiful David Finch one, above. Now, cards on the table time here--I haven't read Action in a good long while. 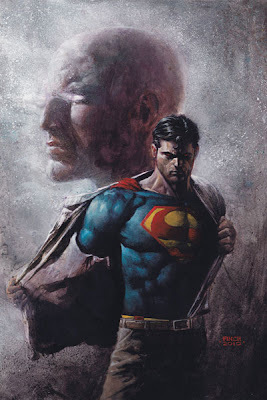 Superman hasn't been in the book (he's been off walking the earth, in case you're wondering), and even though Cornell's Lex Luthor-centric story has received rave reviews, I'm trade-waiting the title. And, no, I haven't followed any of Superman's epic cross-country walk-a-thon, either. So I'm a bit out of the loop when it comes to Big Blue, but I'm looking forward to jumping aboard for this issue, and possibly sticking around for a little while afterwards. Because it's an extra-size issue, the price goes up accordingly, and we have one of those wonderful $5.99 books that everyone says will destroy the industry. We'll see if that pans out, but I'm willing to bet this book will sell well. It's an anniversary issue, after all, and both old and new comics fans tend to pick them up, just because. Let's hope DC delivers with an impactful story to herald the return of their biggest character. Next, we have a book that's in my top five for current series in comics. From Brian Wood and Ryan Kelly, The New York Five, issue four, ships today, and marks the conclusion of this excellent coming-of-age in New York City mini-series. Obviously, since this is the last issue of the story, I wouldn't recommend that you jump on here. If you're reading this book, you know just how good it is. 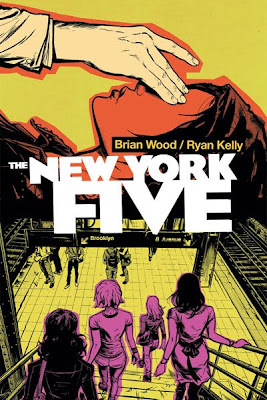 If you haven't been reading, do yourself a favor and go out and buy The New York Four, which is in trade now, and is the first part of this two-series book. And be sure to look for the collected New York Five in a couple of months. Right. Time to go. It's hot. I'm swamped. See you all tomorrow. Oh...almost forgot. Before I head out, what are you Waiting for?